This article is about fox. For other uses, see Gray fox (disambiguation). The gray fox (Urocyon cinereoargenteus) is a carnivoran mammal of the family Canidae ranging throughout most of the southern half of North America from southern Canada to the northern part of South America (Venezuela and Colombia). This species and the closely related Channel Island fox (Urocyon littoralis) are the only living members of the genus Urocyon, which is considered to be among the most primitive of the living canids. Though it was once the most common fox in the east, and still is found there, human advancement allowed the red fox to become more dominant. The Pacific States still have the gray fox as a dominant. Its specific epithet cinereoargenteus means 'ashen silver'. The gray fox appeared during the mid Pliocene epoch Template:Mya ago (AEO) with the first fossil evidence found at the lower 111 Ranch site, Graham County, Arizona with contemporary mammals like the giant sloth, the elephant-like Cuvieronius, the Large-headed llama, and the early small horses of Nannippus and Equus. Genetic analyses of the fox-like canids confirmed that the gray fox is a distinct genus from the red foxes (Vulpes ssp.). 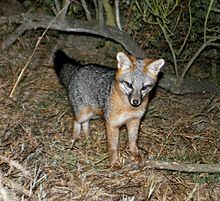 Genetically, the gray fox often clusters with two other ancient lineages, the east Asian Raccoon dog (Nyctereutes procyonoides) and the African Bat-eared fox (Otocyon megalotis). Chromosome number is 2n=66. Recent genetic analysis has shown that the gray fox migrated into the northeastern United States post-Pleistocene in association with the Medieval Climate Anomaly warming trend. The Channel Island fox is likely descended from mainland gray foxes. The gray fox is mainly distinguished from most other canids by its grizzled upper parts, black-tipped tail and strong neck, while the skull can be easily distinguished from all other North American canids by its widely separated temporal ridges that form a U-shape. There is little sexual dimorphism, save for the females being slightly smaller than males. The gray fox ranges from 76 to 112.5 cm (29.9 to 44.3 in) in total length. The tail measures 27.5 to 44.3 cm (10.8 to 17.4 in) of that length and its hind feet measure 100 to 150 mm (3.9 to 5.9 in). The gray fox typically weighs 3.6 to 7 kg (7.9 to 15.4 lb), though exceptionally can weigh as much as 9 kg (20 lb). It is readily differentiated from the red fox by the lack of "black stockings" that stand out on the latter and the stripe of black hair that runs along the middle of the tail. In contrast to all Vulpes and related (Arctic and fennec) foxes, the gray fox has oval (instead of slit-like) pupils. The gray fox's ability to climb trees is shared only with the Asian raccoon dog among canids. Its strong, hooked claws allow it to scramble up trees to escape many predators, such as the domestic dog or the coyote, or to reach tree-bound or arboreal food sources. It can climb branchless, vertical trunks to heights of 18 meters and jump from branch to branch. It descends primarily by jumping from branch to branch, or by descending slowly backwards as a domestic cat would do. The gray fox is nocturnal or crepuscular and makes its den in hollow trees, stumps or appropriated burrows during the day. Such gray fox tree dens may be located 30 ft above the ground. Prior to European colonization of North America, the red fox was found primarily in boreal forest and the gray fox in deciduous forest, but now the red fox is dominant in most of the eastern United States since they are the more adaptable species to development and urbanization. In areas where both red and gray foxes exist, the gray fox is dominant. There are 16 subspecies recognized for the gray fox. ^ a b Maine Trappers Association fur auctions. Mta.homestead.com (2005-12-17). Retrieved on 2011-09-15. ^ Wayne, R. K.; Geffen, E; Girman, D. J.; Koepfli, K. P.; Lau, L. M.; Marshall, C. R. (1997). "Molecular Systematics of the Canidae". Systematic Biology. 46 (4): 622–653. doi:10.1093/sysbio/46.4.622. PMID 11975336. ^ Poole, E. Ann. "Gray Fox". Hikenewengland.com. Retrieved on 2011-09-15. ^ "Gray fox are widespread in Connecticut.". Wildlifeofct.com. Retrieved on 2011-09-15. ^ Geffen, E.; Mercure, A.; Girman, D. J.; MacDonald, D. W.; Wayne, R. K. (Sep 1992). "Phylogenetic relationships of the fox-like canids: mitochondrial DNA restriction fragment, site and cytochrome b sequence analyses". Journal of Zoology, London. 228: 27–39. doi:10.1111/j.1469-7998.1992.tb04430.x. ^ a b Fritzell, Erik K.; Haroldson, Kurt J. (1982). "Urocyon cinereoargenteus" (PDF). Mammalian Species. 189: 1–8. Retrieved 2011-11-27. ^ a b c "Urocyon cinereoargenteus". Animal Diversity Web. Retrieved 2007-08-19. ^ Goddard-Taylor, Gayle (Winter 2005–2006). "The Silver Ghost: The life and times of the gray fox". Sanctuary: the Journal of the Massachusetts Audubon Society. Massachusetts Audubon Society. 45 (2): 13–15. This page was last edited 22:10, 31 March 2015 by Wikipedia user Jdforrester (WMF). Based on work by Wikipedia anonymous users imported>Materialscientist and imported>ClueBot NG.